Detailing the physical features, habits, territorial reach and other identifying qualities of the Red Pavement Ant. A scavenging Red Pavement Ant colony can take over a swath of sidewalk, proving that small things can make a big impact. The colonies of the Red Pavement Ant are usually seen on sidewalks, or driveways, on concrete or asphalt. Stepping on one results in many ants crawling up the shoe and leg where they can potentially bite. They are not poisonous, but their bites pinch. Their presence is enough to cause people to walk around them and not through them. Scouts for a colony constantly search for food and other resources. Red Pavement Ants are often first to find dropped food items and, in little time, summon the clan, completely covering the food item as they eat it and break it down, taking bits away. The Red Pavement Ant is a member of the Formicidae family and have formic acid in their bodies, making them taste unpleasant. Large colonies are built with at least one queen ant that simply lays eggs for a living. This allows for rapid reproduction within the colony. Some males and females are winged and are called 'alates' and mate in flight. These mating swarms are sometimes mistaken for swarms of mating termites, a different subterranean insect. Both genders lose their wings after mating; males die and females land and begin a new colony. Eggs are laid and cared for and kept underground until they hatch. 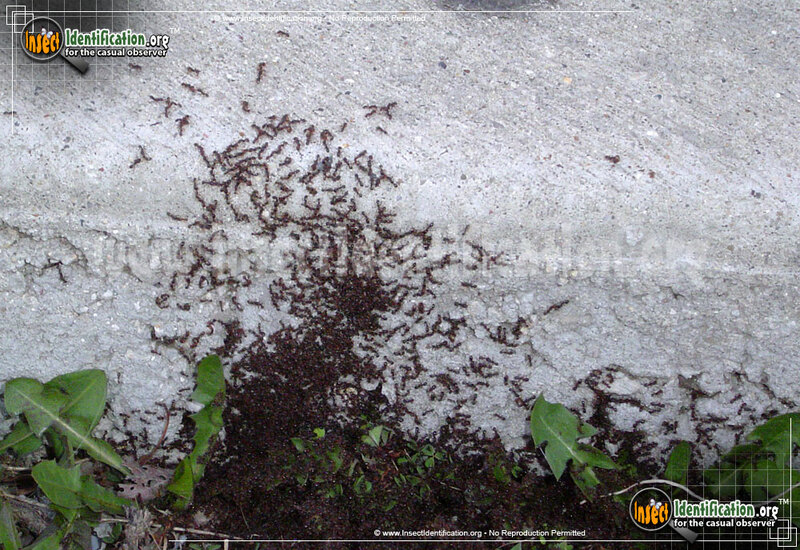 Though ants are typically associated with a fondness for sweets, they consume any food. Because of this, they can become household pests. If a few scouts find food resources inside a building or home, they will infest the area. Their small size and great number make it difficult to control, and severe infestations are best treated by a professional exterminator. Preventative measures, such as sealing cracks in the foundation and removing wood debris from the sides of homes or buildings, and spraying a perimeter of insecticide outside the building may help avoid infiltration. Keeping food contained reduces the likelihood that scouts will find anything worth returning for. Preventing single scouts from returning to the colony with information and directions also helps.